Looking for a fun, simple way to teach your kids more about Advent and the Jesse Tree? The wonderful people at Holy Heroes are offering a free Advent retreat. Every day, you will get a link to an online video lesson about Advent and a second lesson about the Jesse Tree. My 8 year old daughter and I have been following it; she is really enjoying it because kids narrate both video lessons. The website also a variety of helpful free downloads, including a sacrifice list, the words to "O Come, O Come Emmanuel," coloring sheets, word searches and more. To enroll in the free retreat, visit the Holy Heroes website here. While you're at the website, why not order the free Glory Stories CD? 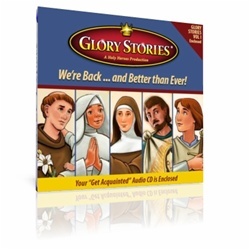 Glory Stories are high quality audio shows about saints that were originally broadcast on Ave Maria Radio and EWTN Global Radio Network from 2003-2006. Production was discontinued on the series and the CDs were getting hard to find, until Holy Heroes recently purchased the rights to them. This would make a great stocking stuffer. Normally these CDs cost $14.75 but for a limited time you can own one for the price of shipping only. Find out more here.